If you live in a city where Uber operates, you know that the taxi service is fast, reliable and affordable, but did you know that it's also easy to become an Uber driver yourself, and earn some extra cash? We'll show you how to become an Uber driver in three easy steps, so you can get out there and start earning money in no time at all. We'll go into the details of how to apply to become an Uber driver, and what documentation and vehicle you need. You'll be surprised how easy it is to become an Uber driver, and how you can fit driving for Uber around your schedule so you can quickly make extra money whenever you want. 2. Make sure your car qualifies. See below for details of what sort of car you need, or take it to an Uber Greenlight location, where an Uber expert will give your vehicle an inspection. 3. Check to ensure you have the correct driving licence and insurance, then wait for Uber's background check to clear. As you'll be driving people around in your own vehicle, you'll need to make sure it's up to the standards Uber requires. Your car needs to be under five years old, and should comfortably seat between four and eight people. The makes and models of cars that Uber allows its drivers to use varies from country to country, so check out the Uber website for a full list. For example, this is the list of accepted cars if you want to become an Uber driver in the UK. As we mentioned above, you can take your vehicle to an Uber Greenlight location for an inspection. If your car meets the requirements you're on your way to becoming an Uber driver. If you don't have a car, or the vehicle you own doesn't meet Uber's requirements, that doesn't mean you can't become an Uber driver – though the process is a bit trickier. You'll need to either rent or buy an Uber-approved vehicle, and thankfully Uber has made this process easy thanks to the Uber Marketplace, which helps you find vehicles to drive. 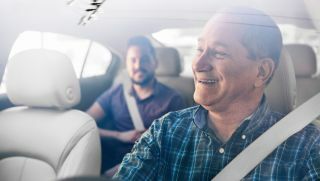 Special discounts and offers are made available to Uber drivers, so you can get a car safe in the knowledge that it will be fit for your career as an Uber driver. Of course, if you do need to buy or rent a car, this will have an impact on the amount of profit you can expect to make as an Uber driver in the short term. If you want to become an Uber driver you'll need to make sure you have the correct driving licence – and if you don't, then you'll need to apply for one. The licence you need will vary from country to country and even city to city. In the UK you'll need a Private Hire Vehicle licence (PHV), which you apply for through your local council. Prices may vary – in London it will cost you £65 for the application, then £35 for the grant of the licence, which will last for 12 months. You'll need to make a booking to have your vehicle inspected, and you'll need to have an MOT certificate that was issued within the last 14 days. In the US you'll need to be aged 21 or older and have three years' driving experience. You also need an in-state driver's licence, and a clean driving record with no DUI or drug-related offenses, no criminal history, no charges of reckless driving and no history of driving without insurance or a licence. Additionally, you must have a Social Security number and a work visa. Uber will run a background check on you, and will let you know whether or not you've passed. You'll need to have the correct insurance when working as an Uber driver, and even if you're already insured to drive your vehicle, you may not be covered to use your vehicle for work or business use, so check your documentation. Price comparison sites such as Compare the Market or Compare.com can help you find a good deal if you need to change your vehicle insurance. There's one final hurdle to becoming an Uber driver: you'll need to attend a two-hour training course, also known as an 'Ignition info session'. It's free, and it doesn't focus on driving, but offers customer service advice, training you how to handle customers and deal with any issues that arise. At the session you'll also be shown how to use the Uber Partner app, which is used to calculate and record your fares. If someone nearby requests a trip, the app will automatically alert you by beeping and flashing the screen. The app will show you directions to the Uber rider's location to pick them up. Be warned – if you're online using the app then you're expected to pick up most driving requests, but you're free to go offline at any time, so you can remain in control of when you work. A video showing you how to use the Uber Partner app is below, and you can also test it out in the app simulator in preparation for your training session. After signing up for Uber you'll be sent an email which gives you instructions on how to book your Ignition info session. When you sign up as an Uber driver you can supply your bank details (or you can add your bank details later). Uber will pay you weekly, usually on a Thursday, and it calculates the amount of fares you've taken between 4am on a Monday and 3:59am the following Monday. The trip fare is based on the duration and distance of each trip, and can vary depending on your location. Uber has a list of fares by location for you to check. If you have to pay a toll during a trip, Uber will reimburse you in full for that. Uber takes a percentage of your trip fare, as well as booking fees, and that also depends on your location. In the UK Uber usually takes 20% of each fare. You should also bear in mind that while you're working for Uber you're actually self-employed, so you'll need to make sure you have the appropriate tax arrangements for your country or location.